Cedar roofing provides a unique appearance for any home. For homeowners who are looking for something more than a traditional shingle roof, cedar shake roofing is a great option. Cedar roofing provides a beautiful finished appearance while also offering long-lasting protection for your home. Middle Creek Roofing are the local experts for cedar roof installation, and we can provide you with a quality new roof for your home. We use high-quality cedar shakes that will stand the test of time and maintain their fantastic appearance. If you're interested in a cedar roof for your home, call us today at 1-717-210-5980 or click below to get started. We offer free cedar shake roof replacement cost estimates in Bethlehem , Reading, Allentown, Lebanon, Newmanstown, Lancaster, Chester Springs, Wayne, Levittown, Haverford, and the nearby areas. Western Red Cedar: Western Red Cedar is a very durable wood that is resistant to insects and other causes of decay, allowing it to maintain its appearance for years. This is a softer material with a rich color. Alaskan Yellow Cedar: Alaskan Yellow Cedar is the hardest cedar in the world, making it very durable and long-lasting. It has a more consistent color and grain than Western Red Cedar, so you can tailor the appearance of your roof to your preference! Why choose cedar roofing for your home? Natural Beauty: It’s no secret that cedar roofing is possibly the most attractive roofing material available on the market. Natural beauty is hard to match and as such there are few man solely man made materials that can compare. Graceful Aging: Most roofing materials become less attractive as they age and their colors fade. Cedar is an exception as it simply begins to take on a beautiful, grayish silver tone. Long Lasting: While Cedar can be a bit more expensive than other materials, it also lasts at least 10 years longer than common roofing materials like asphalt. Durability: Cedar wood shingles and shakes are also resistant to strong winds and are durable in hurricanes, heavy rains, hail storms, snowstorms and other types of severe storms. Energy Efficiency: Cedar wood roofs provide up to two times the natural insulation of asphalt shingles.This allows you to conserve home heating and cooling costs, and significantly save on energy bills. Eco-Friendly: The benefits of using eco-friendly roofing material should not be overlooked. At Middle Creek Roofing we use western red cedar to make our cedar shingles and shakes and are always careful to take care of the environment when we do so. Higher quality means a slightly higher cost: Compared with other roofing materials, such as the popular asphalt shingles, cedar roofing shingles are more expensive and cost more to install. However, this is because it is a higher quality and longer-lasting roofing material compared to most. Requires Slightly more maintenance than average: Just about all roof types need some form of care to ensure their performance. Cedar roofs require regular maintenance to prevent moss, mold and mildew growth. However, if they're installed properly, there are cedar treatment preservatives that can be added during the crafting process to prevent fungal growth and preserve the wood. "Your website indicated you do smaller jobs and you have a..."
While there are certainly some disadvantages to cedar roofing, they are far outweighed by the advantages. Notably, both of the major cons of cedar roofing are easily compensated for or justifiable. While cedar is more expensive than some other options, it is also a higher quality roofing material that generally lasts at least 10 years longer than the cheaper options. Thus the cost is arguably for the extended longevity. If you’re worried about maintenance you can also arrange for regular inspections and maintenance with Middle Creek Roofing. Our cedar roof maintenance services give you peace of mind that your cedar roofing system is being cared for properly. Plus, leaving the maintenance to us gives you one less house chore to do! If you ever have any questions about cedar wood roofing you can always give Middle Creek Roofing a call at 1-717-210-5980. We’ll be happy to answer them or to give you a customized free quote for either a replacement cedar shake roof or a cedar shingle roof. Shingles: Cedar shingles are machine-sawn on both sides, providing a uniform, smooth appearance. They are also thinner than shakes that are cut by hand. Hand-split shakes: Hand-split cedar shakes have a rougher edge that provides a more traditional appearance. These cedar shakes come in both medium and heavy thickness. Tapersawn shakes: Tapersawn shakes are the middle ground of shingles and hand-split shakes. They offer the smooth appearance of a shingle with the thickness of a shake, improving durability while providing a more modern look. Get a free cedar shake roof installation cost quote today! If you're interested in installing new cedar shakes on your home, Middle Creek Roofing is here to help! 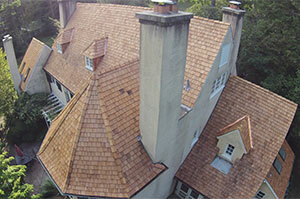 We have years of experience providing quality cedar roofing in Reading, Lancaster, Abington, PA and nearby. We can help you get the best possible solution for your home. Call us today at 1-717-210-5980 or contact us online to get a free cedar shake roof replacement cost estimate for Pennsylvania your home. We are the top cedar shake roofing contractor in Reading, Allentown, Bethlehem, Newmanstown, Lebanon, Chester Springs, Lancaster, Levittown, Haverford, Wayne, and throughout the surrounding areas.